The home side, Bengaluru will play against the Patna side in a Zone B match at the Shree Shiv Chhatrapati Sports Complex in Pune tonight at 9 PM. The Bengaluru won against the Tamil team in last night’s match due to an impeccable performance from both the raiding and defending side. The raiders of the Bengaluru side scored 18 raid points driven by their skipper, Rohit Kumar who scored a Super-10 with 10 raid points, while Pawan Kumar bolstered well with 5 raid points. It was their defense that was amazing on the night with 13 tackle points. Mahender Singh and Amit Sheoran were the side’s best protectors with 4 each. The Patna team emerged as a winner against the Tamil team courtesy a 23-attack point commitment by the Narwals, Pardeep and Deepak. While Pardeep was the best raider with 13 raid points, Deepak wasn’t a long ways behind with his commitment of 10 raid points. The defense of the Patna team scored 10 tackle points, and shockingly Manjeet, a raider, was the best defender in their favor scoring 3 tackle points. Ravinder Kumar, who had a terrible night once more, would in all likelihood be replaced by Jawahar Dagar against the Bengaluru team at the right corner position. The last time the two groups, Bengaluru and Patna, confronted each other was in Match 42 of the ebb and flow season where the Bengaluru got the win (43-41) by a skinny edge of 2 points. Pardeep Narwal and Pawan Kumar Sehrawat the tug of the war between these two giant raiders would be the main attraction in tonight’s match. Both of them will be expected to claim the stake of a whole lot of points in the game. Mahender and Amit were at their peak in performance against the Tamil side and both the defenders were able to acquire 4 points each in their kitty. This pair will be instrumental at keeping the lethal Pradeep Narwal at bay for the Bengaluru side. Vikas Kale with his tough holds and dashes will be the trump card for the Patna side. Vijay although have been on the bench for quite some time now, yet his agile raids and wild tackles will be a major contributor to the score line of the Patna team. 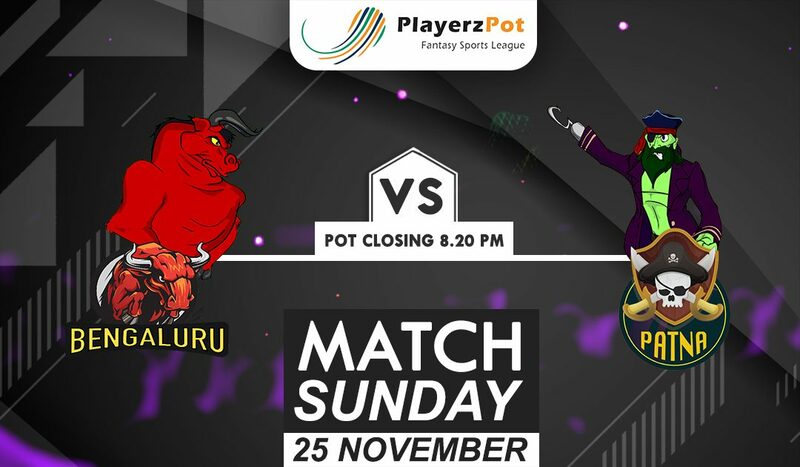 It seems to be a tough decision but we at Playerzpot strongly feels that Bengaluru will emerge as tonight’s match’s winner.